“Tell me about your elite upbringing on the South Side of Chicago. How many silver spoons in your mouth?” [asked Stephen Colbert on his program]. 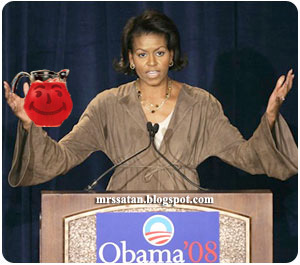 “We had four spoons,” deadpanned Mrs. Obama during her late night talk show debut. Man, she's funny - a regular Totie Fields. No wife of a Republican candidate could get away with that without being on the receiving end of merciless ridicule and low-rent barbs thrown over and over by the Rabid Insane Liberal Clown Posse. work-out sessions with her personal fitness trainer, is she?